System.BadImageFormatException: Could not load file or assembly 'C:\Users\rtaylor\Documents\Visual Studio 2010\Projects\WpfApplication1\WpfApplication1\bin\Debug\WpfApplication1.exe' or one of its dependencies. This assembly is built by a runtime newer than the currently loaded runtime and cannot be loaded. Running the tests directly inside the NUnit GUI works as expected and I have tried changing the Nunit settings inside Resharper's options without success. I had this problem. Have you tried to switch to R# NUnit - check the box next to "Nunit 2.5.9 provided with ReSharper". This was a problem I reported before, that got fixed and is working for me in 2141 - haven't tried the later builds. Thanks, however I did try that without success. As it turns out I am running 6.0.2141.9, so that is interesting that it works for you with the same version. Some more information: If I switch my project to use .Net 3.5, I can use the Unit Test runner, but as soon as I switch to .Net 4, it doesn't work. Unfortunately, that is not a tenable workaround. <startup> <requiredRuntime version="v4.0.30319" /></startup> at the bottom of the configuration block in two files, everything started working again. Hopefully this will help someone else and help point the Resharper guys in the right direction for updating the files as necessary. I tried making these modifications - no luck unfortunately. I'm still getting the same error. This isn't exactly related to the original post, but I found this post while searching for a solution to my problem, so maybe it will help others. My problem relates to running unit tests with Resharper when the code is on a networked drive (which it has to be, since our version control is IBM Rational ClearCase). 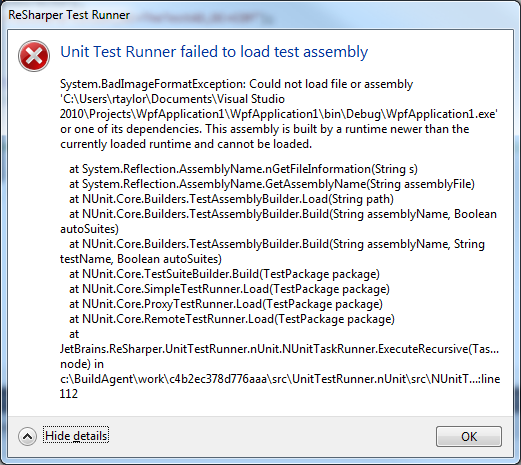 Resharper doesn't like that the code is not running in full trust (or whatever it is). I fixed this by adding <loadFromRemoteSources enabled="true" /> to some .exe.config files to make resharper happy. I opened the following files (path depends on version of resharper) and added <loadFromRemoteSources enabled="true" /> in <runtime> in <configuration> (as in screenshot). System.NotSupportedException: An attempt was made to load an assembly from a network location which would have caused the assembly to be sandboxed in previous versions of the .NET Framework. This release of the .NET Framework does not enable CAS policy by default, so this load may be dangerous. If this load is not intended to sandbox the assembly, please enable the loadFromRemoteSources switch. See http://go.microsoft.com/fwlink/?LinkId=155569 for more information.